There are many entities involved in the movement of your cargo and considerable opportunities to sustain a loss. 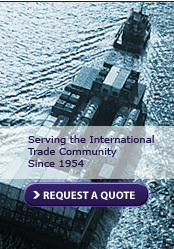 In order to protect your investment from theft, negligence or acts of God, it is imperative to obtain cargo insurance. By purchasing a policy from Sack & Menendez, you can rest assured that your goods are protected throughout their journey. As your Customs House Broker we are in an ideal position to handle your coverage. The fact that we have immediate access to all of your cargo documents reduces your involvement in the documentation process. This not only saves you time, but accelerates the reporting and ultimate settlement of your claim should one arise. As opposed to offering standard cargo insurance, we work closely with our providers to write a comprehensive policy customized to meet your unique transportation needs and to substantially limit your exposure to various risks. Because of our volume, we are able to offer these tailor made policies to our customers at competitive rates. In most cases the liability of the carrier is severely limited by the terms of sale. Steamship lines can be limited to as little as $500 per container while compensation by international airlines can be as low a $9.07 per pound. Domestic airlines and domestic truckers are customarily limited to $0.50/lb but this may vary by carrier. To check the coverage provided by the carrier you can usually look at the terms of liability found on the back of the bill of lading. Allowing the shipper to handle the purchase of cargo insurance can also be a costly mistake. Insurance for your freight provided by the seller does not always provide coverage all the way to your door. Additionally, if the insurance was purchased overseas you would be forced to handle any claims through the foreign insurance company. This can often be difficult and time-consuming delaying the settlement of your claim. Another issue importers often overlook or are unaware of is General Average. This is a maritime principle that is acknowledged by all maritime nations. It is based on a shipper's equity in a voyage and states that if damage occurs to the cargo and/or vessel the cargo owners involved in that voyage share in the financial burden of all lost and/or damaged cargo plus the cost of the repairs to the vessel. This is the case even if your cargo is not damaged. A general example of this principle is that if a ship were to jettison cargo to free it self, hence saving the ship and voyage, all of the owners of cargo on that vessel would bare their portions of the costs. By purchasing your cargo insurance through Sack & Menendez we can make sure that your shipments are protected against these risks. If something happens to your shipment you can rest assured that you are protected. Simply contact us and we will walk you through the steps necessary to get your claim settled promptly.